Remember Ananda Jayasundara, who was rated as Ceylon's fastest bowler in 1964, while a schoolboy at Dharmaraja College?. Ananda hails from sporting family. All his brothers did Dharmaraja College and Kandy proud in sports. His twin brother Upananda, was a top class cricketer, boxer, athlete, footballer and hockey player. He is a well known cricket coach, specially at junior level. He was the first to coach Kumar Sangakara, and has produced several cricketers. He has his own academy and also coaches the Mahamaya Girls College cricketers. Upananda is a sports correspondent for the 'Daily News', 'Sunday Observer' and 'Dinamina'. The other brother's - late Parakrama too was a good sportsman. Late Daya ws well known in the rugby field and was a top third row forward, coach and a referee. Sarath, Gamini and Senarth all did well at sports for the Lake View School. There was a story in the 'Daily News' of August 24, 1964 - headlined - 'Many youngsters in Up-Country Eleven' - Pakistan will face Ceylon's fastest bowler Ananda Jayasundara". That year, the Up-Country side was packed with some top class cricketers and were led by former Tamil Union A & CC and Kandy Lake Club's cricketer Bertie Gomez. Rest of the team was made up of players like M.Enver Marikar (Kandy Lake Club), T.B.Marasinghe (Kandy Lake Club), V. Sivanathan (Peradeniya University Recreation Club), M. Peries (St. Paul's and Kandy Lake Club),Ubaya de Silva (Dimbulla ACC), Cyril Earnest (Peradeniya University Recreation Club), M.T.M. Zaruk (Trinity College), Neville Hearthge (St. Sylvester's and Kandy Lake Club), Ananda Jayaundara (Dharmaraja College), 12th man M.Wijekoon (Dharamaraja College). Pakistan had players such Intikab Alam who was rated as he hardest hitter and superb leg spinner of he game at that time, Farook Hamid, Asif Iqbal who was only 17 and Fhulam Annas to name a few. This game was played in Kandy due to the efforts of late E.W. Balasuriya who was the king pin of Kandy in the sporting field at that time, and was also the founder - president of the Kandy Lake Club. The day before the match, Mayor of Kandy late E.L. Senanayake and the members entertained the two teams to tea at the town hall. The Pakistan High Commissioner too was there. At the end of the game. M. Razak a leading citizen in the hills hosted the two teams to dinner at Queen's Hotel. Then in 1964 on April 27 and 28 - Combined Kandy Schools played the All India Schools team. The local team was led by M.T.M. Zaruk, and he his side went on to score 163 runs with great difficulty, due to some superb bowling and fielding by the Indians. Skipper Zaruk went on to score 48 with three hits to the fence. B. Jayatilake 29, S.B. Elikawela 5, Harindra Dunuwille 11, R. Burke 0, Nihal Samarasekara 13, A. Ratnaweera not out 02, Ananda Jayasundara 13, W.T. Hurugamuwa 0, H.A.Ranasinghe 36. The Indians in reply made 228 for 4 - Indrajith Sing 19, R. Nagdev 133 made some super strokes round the grounds. In his century he had 14 boundaries and three sixes. L. Edmons 20, Imran Ali 10, Amaranath not out 20. Out of the four wickets tat fell opening bowler Ananda Jayasundara had 1 for 19, spinner Harindra Dunuwille 2 for 49 and W.T. Hurugamuwa 1 for 56. Kandy Schools in their second outing, were struggling at 122 for 7, when the game was halted at 3.30 pm as the Iandian cricketers had to catch the train to Jaffna from Polgahawela. Once again it was skipper Zaruk who made 42, H.A. Ranaisnghe 30, Nihal Samarasekara not out 14. Coming back to Ananda Jayasundera, he was the best cricketer out of the Jayasundara brothers. He represented the school in all most all sports, such as cricket, football, hockey, athletics and also played rugby after leaving school for the Peradeniya University. 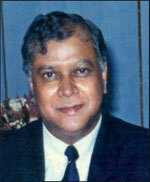 Ananda was the senior prefect in 1965 and won the Sir Bennet Soysa Gold Medal. He was also in the Combined Schools team (Sri Lanka Schools), and played with cricketers such as Ranjith Fernando, David Heyn, and Anura Tenakoon and Harindra Dunuwille. Ananda's best bowling figure was 7 for 37 against his rival school Kingswood College in the big match played at the Police Grounds matting wicket. After leaving school he continued his cricket, and joined the Bank of Ceylon and retired as the Assistant General Manager. He played his pet sport - cricket for Old Rajans, Kandy Cricket Club and Up-Country. In athletics, he came second to S.L.B.Rosa of (Brevets College), in the Dharmaraja College annual Road Race in 1963. In the year 1964 Ananda came second in the 800 meters event to K.S. Senaratne of Hunumulla Central in their Junior Athletics Championship. At the University he continued all his sports, and played rugger as a wing three quarter along with S.U.Mendis, Lakshman Karunatilake. He was also a top class athlete. He won the 800 yards and also was placed second to Prasad Perera who broke the All Ceylon 800 yards record. He was selected as the Best Sportsman in the University in 1969. Ananda also played Hockey for Kandy District Hockey Association team in the 1960's and led the side in 1970. Some of his team mates were D.D.P. Alwis, Malcolm Perera, H.G.R.Rupasinghe, At present he is helping sports in big way specially cricket. He is also one of the Directors of the Cricket Academy run by his brother Upananda.